It’s 4.18am, and where are you? Are you one of the lucky oblivious, or are your crowding thoughts keeping you awake? In Let Them Eat Chaos, Kate Tempest drops you from distant space into teeming humanity, guiding you ghost-like through the minds of seven people. They may well be seven people you know. This is an album of spoken-word poems set to atmospheric music, a series of individual narratives threaded together. If hearing the word ‘poem’ takes you back to stanzas in the schoolroom, or you picture a beret-wearing beat artist clicking his fingers, it’s time to experience how poetry has evolved. Spoken-word has undergone a modern resurgence, with artists vibrantly exploring the individual and society in ways that are deeply relevant to psychologists (see https://thepsychologist.bps.org.uk/new-voices-slam-science). When performing live Kate Tempest is one of the best, and much of that energy translates to this album. A critically acclaimed poet, she fills each track with details that create rich images. Her style is torrential, by turns urgent, desperate, arch and joyous, with a delivery that sweeps you along on the journey. The album has the beat of rap, the flow of poetry, and the characterisation of a novel. Forget wand’ring clouds, thees and thous; this is poetry for the present, using our own words to tilt the world we know to a new angle. ‘His thoughts are like a pack of starving dogs, fighting over the last bone.’ Kate Tempest’s characters are awake, vulnerable and charged with cortisol, her poetry creating inner monologues that feel authentic. The minds we’re introduced to are failing to outrun their past, attempting to process their present, questioning their existence, dealing with loss or spiralling with intoxicants. This is a gift for anyone interested or working in psychology, and the focus and detail of the poetry revitalises concepts commonly encountered. Thoughts that flash past reveal the daily anxieties of those who are coping-not-coping. Drug and alcohol use is the norm, causing problems but, as in life, channelling fun and creativity, staving off boredom. The poems are at their best when they confront the contradictions inherent in behaviour, and a recurring topic is the continuation of action that the characters feel they can’t control. A theme of Kate Tempest’s previous work has been the representation of working class voices, and that continues in this album. Graffiti tags, a blight whitewashed over by gentrification, represented safe territory to Zoe. Esther is a shift-working care assistant struggling with the crises humans cause, and Pete’s living back at his parents with nothing to save for. Part of Kate Tempest’s power is in her voice, and her delivery and intonation subtly alter to convey the mood and heart of her characters. For many, this album will bring humanity to statistics seen in the news. ‘The myth of the individual has left us disconnected, lost and pitiful.’ Is there a psychologist out there who hasn’t speculated about the effects our changing world has had on the psyche? The mind at 4.18am acts as a lens through which the fallout of modern life can be considered. Our consumerist society is analysed throughout, and to say it’s found wanting is an understatement. Many of the characters are hitting the limits of what consumerism can provide, and struggling to process their need for something more. The story of the album is set in London, but the themes resonate across people and places. At a time when changes to the benefits system are brought to the big screen in I, Daniel Blake, Let Them Eat Chaos presents the repercussions of low wages, gentrification and globalisation on people’s minds and actions. If this sounds bleak – it is, but I had to laugh at the line ‘I don’t speak the lingo/Since when was this a winery, it used to be the bingo’. ‘You’re more than the three or four you’d go to war for.’ The poems focus on the plight of individuals, but in the background bigger issues can be glimpsed. The album stresses the need to recognise our connection with wider humanity, beyond those immediately around us. The dissonance that the characters experience in distracting themselves from global crises contributes to their isolation and anxiety. The album ends with Kate Tempest exhorting the listener to love more, to see the similarity with those we think of as ‘other’, and to take responsibility for our society. Listening to this at the end of 2016, a time when many of us are suffering news burnout and trying to turn off the world, this resonated deeply. For psychology as a discipline and a profession, these poems raise questions about whether we’re equipped to help individuals deal with the far-reaching tragedies humans have created. 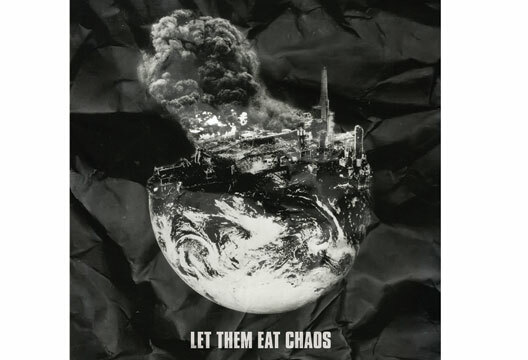 Listened to as a whole, Let Them Eat Chaos convincingly weaves a world in which you eavesdrop on the internal monologue of people you may speak to every day, portraying the effects of the modern world on the mind. But when did you last sit and listen to an album for 45 minutes? Kate Tempest critiques our society for its constant distraction and disengagement. If you can overcome those traits for long enough, you won’t find this album easy listening, but you’ll find an absorbing, thought-provoking and energising experience.